This Wordpress Theme offers the design of the HTMl5 Up Dimension template in a format that does not require knowledge of HTML editing (and offers a few things more as a bonus). 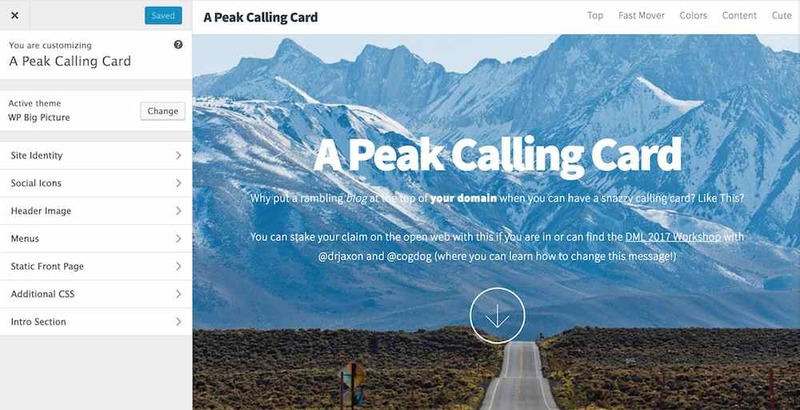 This kind of theme is good for the top level of a domain as a "calling card" for an individual or a project. It uses large images and animation that occurs as you scroll down the page. Sections can be used as "teaser" blocks with links to a full page of information, or longer pieces of content can be used on the front page. The footer offers a place to attach social media links. The top/splash screen is configured in the Wordpress Customizer. The backdrop image is managed by the Header Background controls in the Customizer, which means you have an option of loading several images that can be set to appear at random on page load. Subsequent sections as you scroll down (or use the automatic generated menu) are managed as separate posts. If the post has a featured image, it's layout will be with that image as a large background, with title and content in the boxes. The theme automatically alternates between left/right side content that animates as the page is scrolled into. This theme was developed relatively recently but a few people have already put it to use. We have a demo site that was created the same way here on StateU as you can or will do. Big Picture is what you will get as a default site when you build it here. Are you ready to install this site? The instructions below are available (at least for now) only via the StateU site. Anyone can create an account there to try this pre-built theme. If you want to try this on your own domain, you can get the theme and instructions from GitHub. It will take a few more steps there. 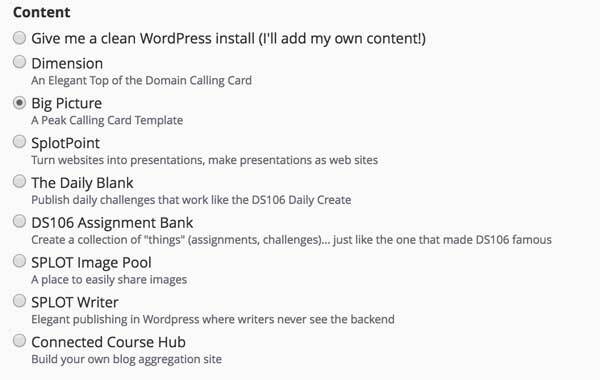 Like you did when setting up your first Wordpress blog, start at your StateU dashboard and under Applications click Wordpress. Click the Install This Application button. As a calling card, this should be set up at the top of our site, so you should leave the Location settings field blank to put this Wordpress site at our domain entrance. But this is your domains, and you are welcome to put it in a subdirectory too. Mr. Rebeg could put this new site in a subdirectory (You can have a different Wordpress sites sitting within the URL of another, it is smart like that). The next section is called Versions. Under the Content heading you will see a few options for the template to use; choose Dimension to install a version of Wordpress with all of its functionality built into your new site. Note: If these versions are not listed, just continue and install a plain Wordpress site; see the next section for how to install an Instant Site version. Now scroll past a few sections until you get to Wordpress Settings. You can edit your own admin user name and password, but it's not necessary-- you can log into your directly from this interface later. So you can leave the random generated values for now. We suggest leaving all options in this screen as they are. That makes it EASY. That's it! Now click the Install button in the bottom right, and just watch the progress bar slide across the screen. It will take a few minutes at most to bake your site. The second link from the installer (it ends in wp-admin allows you to log in as the admin user of the site, so you can start customizing and editing your site. It will land you inside the Wordpress Dashboard..
You know you are logged in as an admin user of your site when you see the black menu bar at the top of your screen, it will be there too when you visit your site. Get to know how to navigate between the Dashboard view and the Site view (and back, the animation below is for a different site, but it works this way on all Wordpress sites). If the Wordpress installer did not offer this theme as an option, we have another way to get your site set up. This will also work on an version of Wordpress installed on a domain you manage, not just here on StateU. Install a Plugin. Log in to your site's admin area. In your new site's Dashboard, go to Plugins and search for, install, and activate the All-in-One WP Migration plugin. Import the Package. Once the plugin is installed, look for it listed in the left side of your Wordpress dashboard- select the option below it for Import. Drag and drop the .wpress file you dowloaded above onto the importer. Wait for it to simmer/upload. You will be asked to confirm overwriting an existing site. Agree. You will now have an exact copy of the same starter site you would have gotten from the StateU installer above. You will have to return to your Apps listed in your StateU cpanel, and log in again as an admin. You can now continue with the directions below to customize your site. >Log in to your site via the admin link (see above). Switch now to the public view of your site, and in the top admin bar, click Customize -- this opens an interface for changing much of your site and being able to preview it as you make changes. You can safely experiment with the various settings, nothing is changed on your site until you click the Save button. See the theme documentation for more specific directions on what can be done with the customizer. See the theme documentation for more details on editing. You can add a new section at any time by using the New -> Post menu item from your Wordpress Admin bar. The title and content is what appears in the box. If you add a featured image, you get the kind of front content box with an image, and content that alternates between left and right side. The location of the more marker controls the split between content that appears on the front (shorter) and full content on a separate page. You can have up to 10 sections on your calling card. The order of appearance is controlled by the value of in the Attributes box of each post. 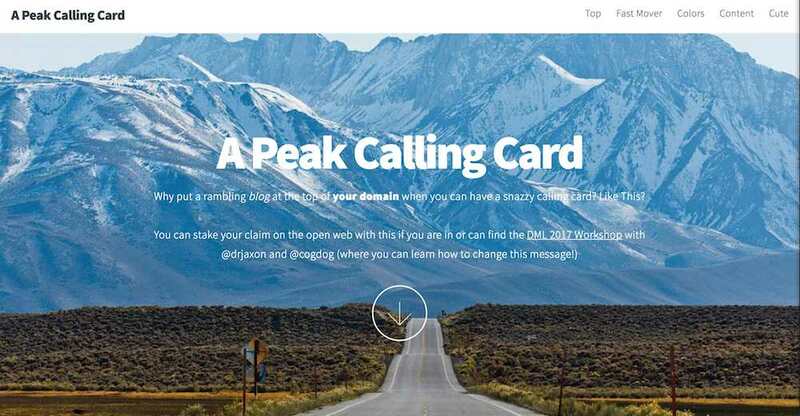 Give it a go and see how much you can dress up your calling card site. If you really are ready to go fancy, see how to add the custom image gallery.